The subject of pollinating fruit trees is seldom written about in PLAIN ENGLISH! And that is why many people bypass it. But there is no surer way to increase the size of your harvest, and ensure your success in growing fruit trees. Planning for adequate cross pollination is something you do only once! You don’t have to keep doing it year after year. Do your research now to find the right combination of trees that “get along well together.” Once they are in the ground, they’ll do the work for you each harvest season. Bees are a necessity for pollination of fruit trees. A well placed beehive or two will benefit your orchard, although your ability to run needs to be factored in. Creating a flower and herb border or planting flowering shrubs will enhance your chances of successful pollination. Honeybees are enticed to visit or take up residence near your garden and orchard by planting echinacea, bee balm, roses, butterfly bush, etc. for them to feed on. Some people are die hard do it yourselfers and you have to give them credit for imagination and persistence. Some do their own pollinating with a tiny paint brush or a cotton swab and absolutely swear by it. You will need a very long reach and the ability to remember where you’ve been. This activity is not necessary as long as you have the right combination of trees planted together. Nature, and wind, will do it for you. Others cut a few blooming branches off of a neighbor’s fruit tree and hang them amid the branches on their own tree to aide pollination. Long ago, an elderly man told me he would roll up a newspaper or magazine and “slap the dickens” out of the trunk of his apple tree early every Spring. “Stimulates the darn thing!” he assured me. (No, I didn’t laugh!) He always had beautiful fruit with just one tree. Who can argue with success? Self-pollinating trees will produce more fruit when planted with a good pollinator. Conversely, self-pollinating trees make excellent pollinators for non-self-fertile varieties. There are exceptions to every rule, and some fruit trees simply do not get along well together. Because of this, it is good to call the garden nursery first. Ask to speak to a horticulturist to make sure your chosen varieties will pollinate each other. APPLES: Most apple trees require a pollinator. 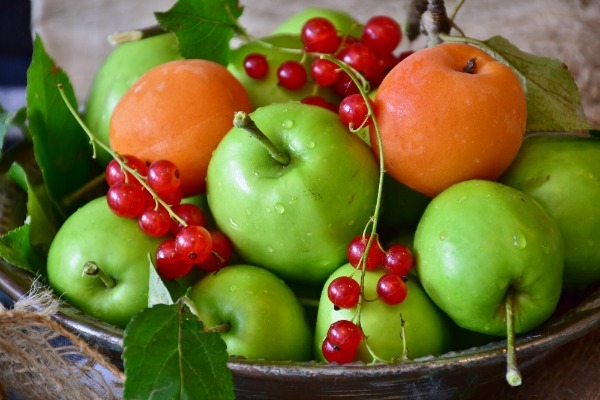 “Winesap, “Staymen,” and “Crispin” Apples cannot pollinate other varieties. Ornamental Crabapple trees make wonderful pollinators for apple trees. 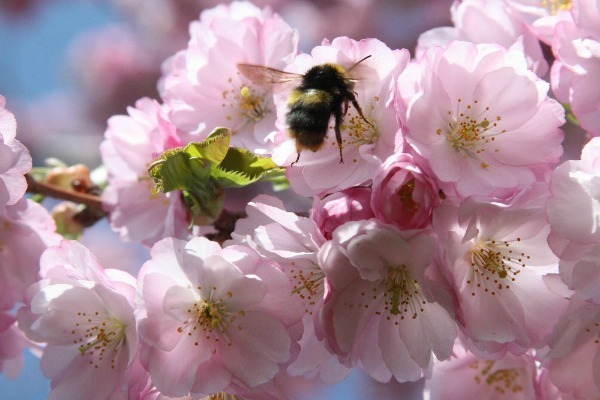 CHERRIES: Most sweet cherries require a pollinator. Self-pollinating sweet cherries make excellent pollinators. Most tart (pie) cherries do not need a cross pollinator. Tart and sweet cherries will not pollinate each other. PEACHES AND NECTARINES: Most peaches and nectarines are self-pollinating. Peaches and nectarines can pollinate each other. Keep both of them away from plum trees for on occasion they will cross and produce a strange, and not necessarily very tasty, new variety. Keep almond trees completely away from peach and nectarine trees. If planted together, it will sometimes adversely affect the flavor of the fruit, as well as the nuts. PEARS: Most pears require a pollinator. “Bartlett” and “Kieffer” Pears are self-pollinating and are also excellent pollinators for other pear trees. “Bartlett” and “Seckel” Pears do not pollinate each other. European and Asian Pears can pollinate each other. PLUMS: Most plums require a pollinator. European and Japanese Plums do not cross pollinate. The pollination of plums and prune plums is very complicated. It is said that the more varieties you plant, the better your chances of successful pollination will be. « WHAT IS CROSS POLLINATION?